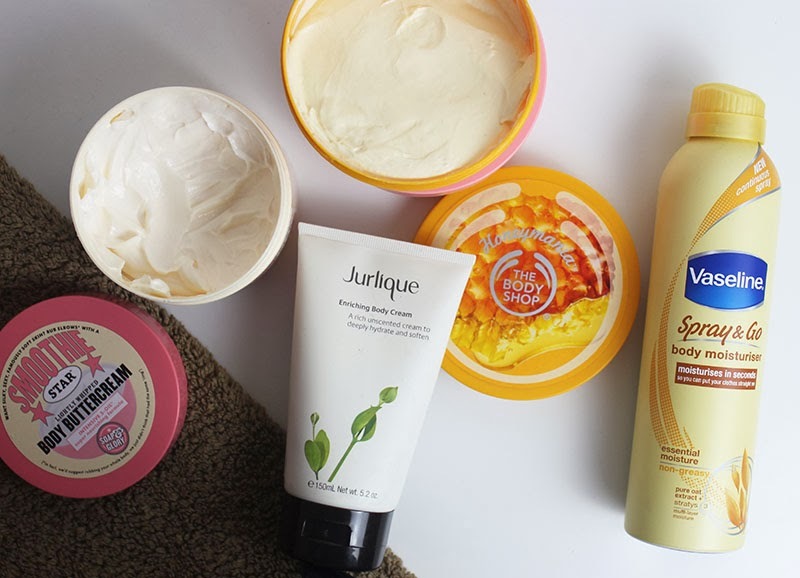 Summer is pretty much the only time I think about Bodycare (bad- I know!) so I’ve taken the last few weeks to try new products in an attempt to get my body Summer Ready and thought I would share some of my top recommendations. I raised my nose up at this initially as the particles just didn’t look good enough but I have actually gone and fallen in love with it, it may even be my favourite scrub ever (joint first at least). It’s got quite a minty scent which although is a little strange I do like as it’s cooling and refreshing on the skin. On the body it feels like it’s removing everything but without being too abrasive and most importantly leaves my skin incredibly soft. As far as body exfoliators go this one is fairly expensive although a little goes a long way. I am thinking of saving mine to take on holiday as a bit of a treat, it really makes the skin look amazing. This seems to be a favourite with lots of people, I love it particularly now in the summer as it’s cooling and soothing on warm skin and on tired legs. It does exactly what I want a moisturiser to do without irritating the skin at all. It’s also suppose to be amazing for anyone with eczema however I can’t comment as I don’t have any but if you do and have tried this I would love to know how you found it. I’m not claiming this works nor that it doesn’t as I simply haven’t used it for long enough and am not that anything but exercise can truly get rid of Cellulite. However I have really been enjoying using this on my thighs and bum, it tingles it a little which makes me think it is at least increasing the circulation to this areas which could potentially help reduce any dimpling. My skin always looks better a couple of shades darker but sometimes I just haven’t got the time to do an over night tan which is why the He-shi 1 hour tan is so perfect. I personally like to leave it on for a little more than just an hour (about 3/4 hours) for a deeper tan but leave it on overnight for one of the darkest fake tans I have ever tried. I’ve got a few different scents of these but this scent blew me away, I just love it, although they are a little more subtle in the shower. 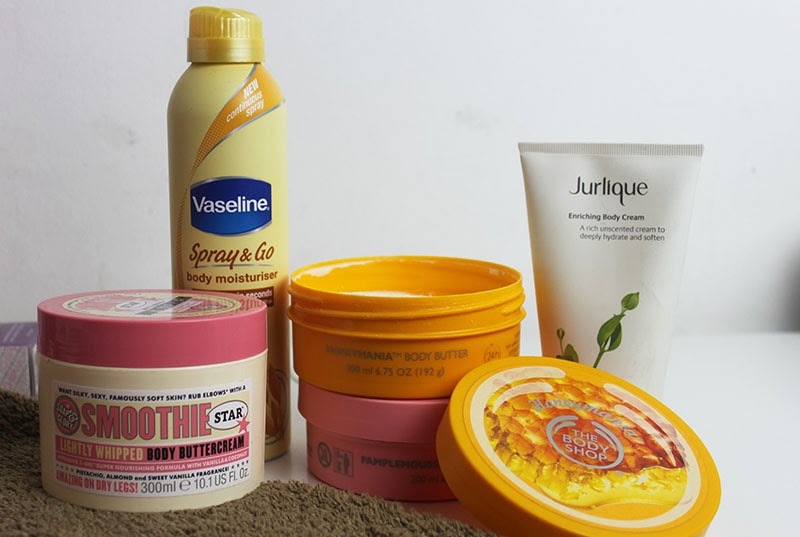 These are ideal for the summer as they have a cooling effect of the skin, they aren’t particularly heavy or sticky so are ideal for the day time but I would use something a little heavier at night. These launch on the 16th July and there are some great other scents so it’s worth keeping an eye out! 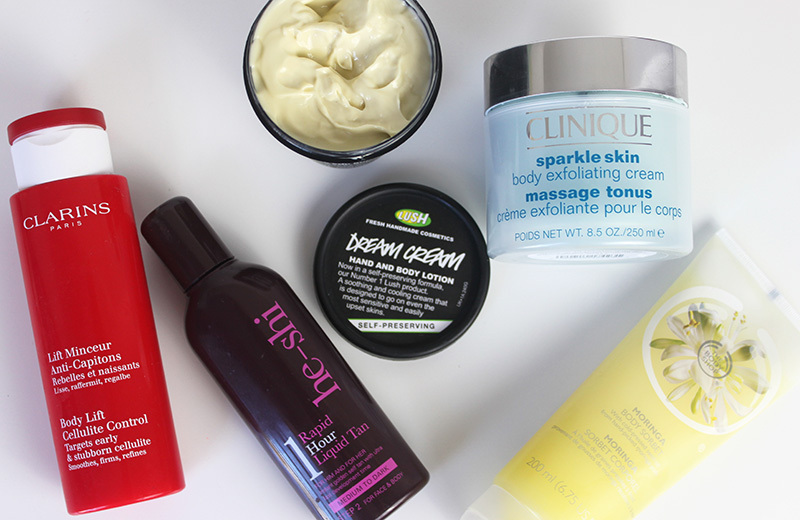 What body products have you been loving? Are there any products you use every spring/summer? 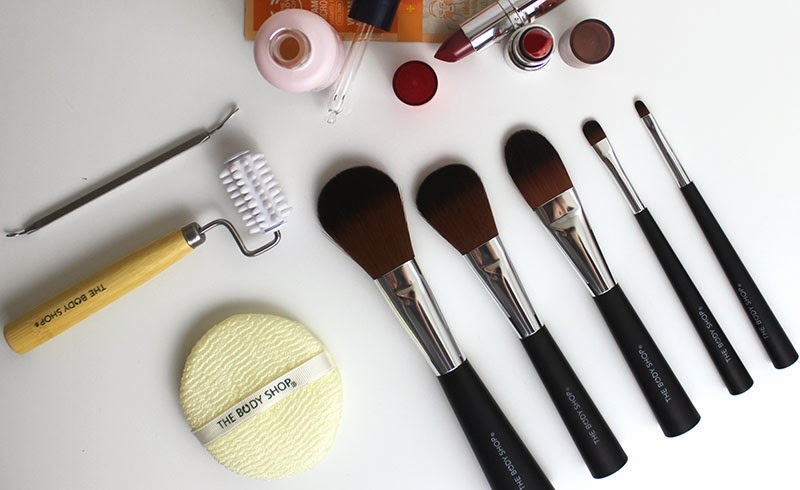 Beauty tools make life just that little bit better and even more luxurious but finding the right tool for the job that won’t break the bank is particularly difficult! A few years back (actually more like 8 years back) I discovered that The Body Shop offered great affordable tools. I must admit that although they aren’t my favourite tools ever (Real Techniques would probably steal this) they are still great quality and would highly recommend them if you are looking for affordable good quality brushes. 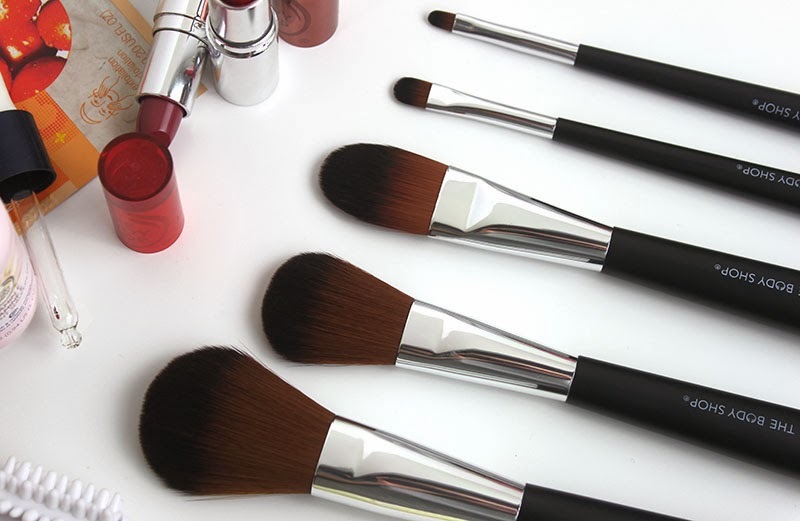 They have a good range of eye, lips and face brushes which are very sturdy, sleek and all high-quality synthetic hair. Prices of individual brushes start at £8 for an eyebrow brush and go up to just £18 for a Face & Body brush. However they have no partnered with Teenage Cancer Trust to give us all an even better deal whilst raising money for the charity. They now have an Essential Brush Collection retailing for £18, The Expert Collection retailing for £30 and the Ultimate Collection retailing for £30 all with a £15-£20 saving! Above I have the Expert Brush Collection photographed which actually comes with a great selection of brushes. My favourite things however are The Body Shop’s skincare tools, especially as skincare tools seem to be quite hard to find. I’ve used and loved the Double Ended Blackhead Remover since being a teenager, I know you are always told not to pick at spots but sometimes I just have to and this way I can do so without using potentially dirty fingers. I’ve also always had a few of the Facial Buffers in my skincare draw which I often use with my cleaners or even mask to also help exfoliate my skin. My newest discovery is the Facial Massager which I’ve only been using for a few days, it’s quite an unusual tool but I’ve heard it is great for congested, cystic acne prone skin like mine. If you are as confused as I originally was check out Caroline’s blog post but I’ve actually really been enjoying it. They also sell muslin cloths which are great for cleansing, Face Loofah pads and more which I will be looking to try soon! 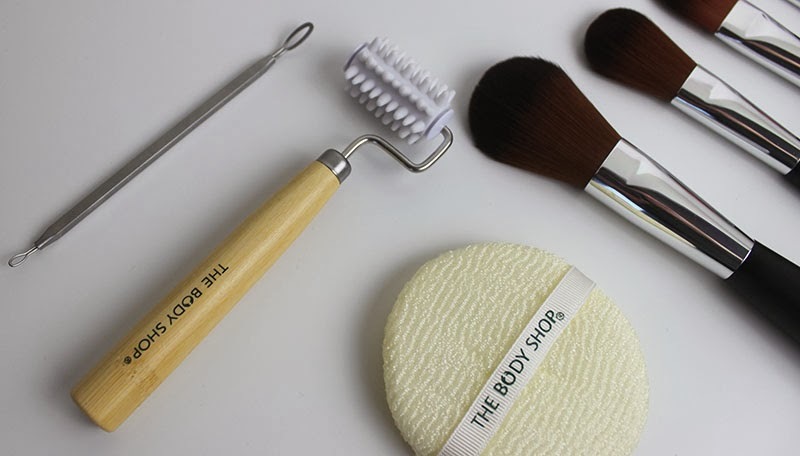 What beauty tools have you tried from The Body Shop?